Last evening, I made the peas and avocado pesto, and was wandering what all recipes I can use it in. 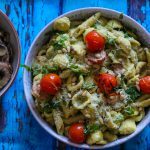 Pesto pasta, is the first thing that comes to mind, when you are thinking of using pesto. Right ?So I decided to cook, peas and avocado pesto pasta. It was a weekend anyways, so I really wanted to make something quick and cosy and snuggle in front of the TV. So pasta it was for us !This was really easy and took just 10 minutes to cook, as the sauce was already there. I teamed it up with salt and pepper mushrooms, and our quick , healthy and delish meal was ready! Come let’s check out the detailed recipe. You would need the peas and avocado pesto for this recipe, which you can find here. Boil pasta in a big pan with enough water, a little salt and oil, till it is al Dante( time it as as per the instructions). Once done, sieve the pasta, but do not throw away all the pasta water. Keep a bowl of the pasta water, to be used later in the recipe. In another pan, heat a little olive oil. Add freshly crushed garlic, onion salt, garlic salt, oregano seasoning, chilli flakes, sun dried tomatoes(if you have them), and baby tomatoes. Mix and sauté for a minute. Toss in the peas and avocado pesto, mix well. Add the leftover pasta water ,and stir to make a creamy flavourful sauce.Now add paste, stir. Your pasta is ready. Serve immediately, topped with parmesan shavings( or grated parmesan), pine nuts, and black pepper. Sautéed salt and pepper mushrooms make a perfect accompaniment to this pasta! To make this vegan- add nutritional yeast in place of parmesan, or skip using any cheese. If you try this recipe, I will be happy to know! Leave a comment ,your suggestions, questions and feedback, in the comments section below.I will be happy to revert. Subscribe to the blog to get regular updates! Fresh peas and avocado make a creamy delicious pesto sauce, for this flavourful nutty pasta. Boil pasta in a big pan with enough water, a little salt and a tsp of oil, till it is al Dante( time it as as per the instructions). Once done, sieve the pasta, but do not throw away all the pasta water. Keep a bowl of the pasta water, to be used later in the recipe. In another pan, heat a little olive oil. Add freshly crushed garlic, onion salt, garlic salt, oregano seasoning, chilli flakes, sun dried tomatoes(if you have them), and halved baby tomatoes. Mix and sauté for a minute. Toss in the peas and avocado pesto, mix well. Add half a cup of pasta water (just enough to make creamy sauce- add more if needed),and stir to make a creamy sauce. Add pasta, stir. Your pasta is ready! 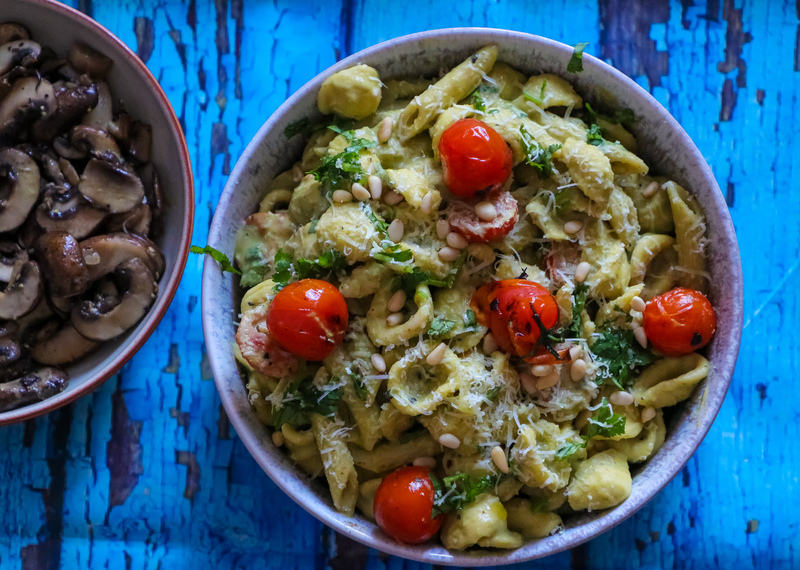 Serve immediately, topped with parmesan shavings( or grated parmesan), pine nuts,EVOO ,crushed black pepper and chopped coriander/parsley leaves. Sautéed salt and pepper mushrooms make a perfect accompaniment to this pasta! Using onion and garlic salt, adds a lot of flavour to the pasta. If this is not available, you can skip using these and use regular salt for seasoning. Vegan option- To make this vegan , add nutritional yeast instead of parmesan, or skip using any cheese.